Today was special because the entire community of Kanton, which only totals 23 people, came over to the Nai’a to share a meal with us. 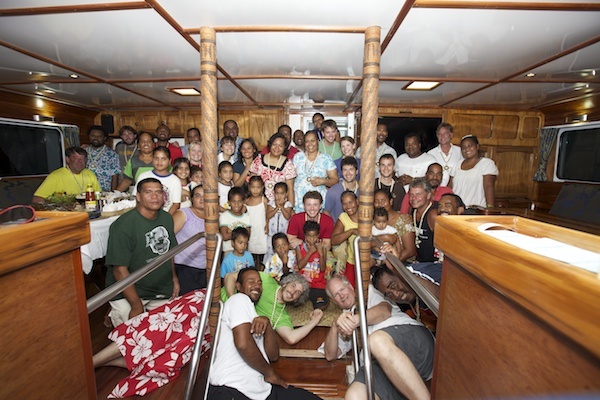 These families are often placed on the islands for 2 to 5 years as caretakers for the Phoenix Islands – they are extremely isolated and rely on a government ships from the capital Tarawa for their supplies. All the science team got dressed in their ‘sulus’ (which is the Fijian word for a sarong). 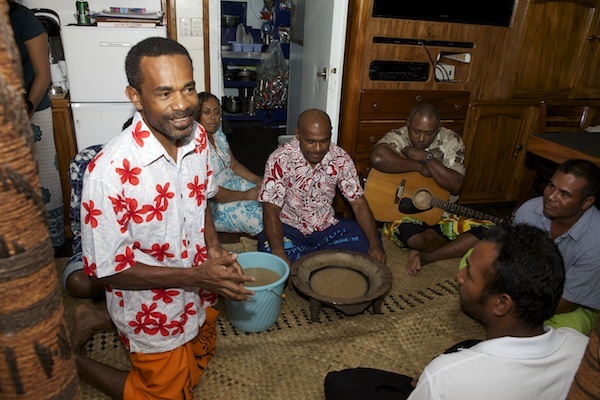 The Fijians did a traditional welcome ceremony, and then the I-Kiribati did the same. This was perhaps one of the most heartfelt moments of the trip so far. The I-Kiribati people thanked us for visiting their islands, for our friendliness, our invitation to share a meal with each other. They gave us beautiful necklaces that they had hand produced. The children also gave us letters they had written to the New England Aquarium and others who had donated books and pens, etc. to the local school there.